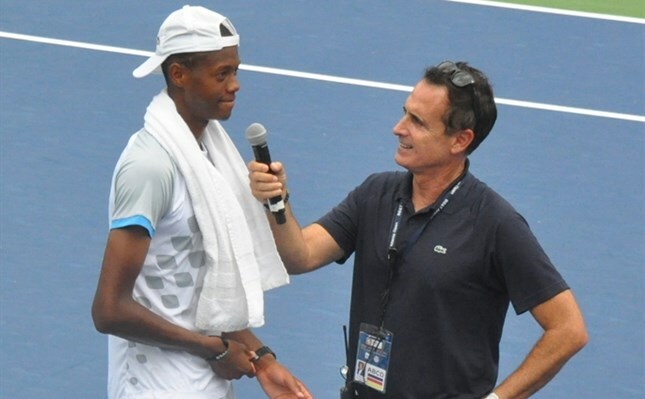 Georgia Tech’s Christopher Eubanks kept his magical week at the BB&T Atlanta Open going as he and partner, Donald Young advanced to the doubles semifinals at Atlantic Station with a thrilling 4-6 7-6(5) 10-2 win over Austin Krajicek and Nicholas Monroe. Eubanks and Young found themselves up an early break in the opening set before the veteran pairing of Krajicek and Monroe found their rhythm on serve and return to close out a tight first set. The Atlantans stayed with the more experienced doubles players in the second set and edged out a tiebreaker 7-5, with Young showing leadership, keeping Eubanks in check. Both Young and Eubanks showed aggressive play and put in first serves to take the match tiebreak 10-2 as Krajicek and Monroe wondered what went wrong. Eubanks, an amateur competing in his first ATP World Tour event is having the time of his life. Young said he enjoys mentoring the college player. Eubanks says his first ATP World Tour event has produced many positives he can take back to his college teammates at Georgia Tech. “You have to be a little more professional and be ready. At this level, it’s hard to just do what (you want). You have to dial in on every point and after that it comes down to volleying and making shots. Young says he appreciated the ability to be on the court with the Georgia Tech sophomore and seeing how well he is playing.